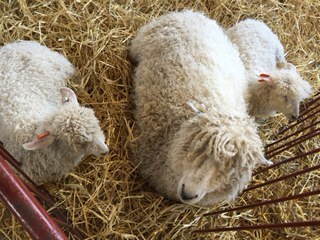 The Massachusetts Sheep and Wool Festival was this past weekend. I wasn’t driving so I decided to engage in risky wool activity. Using combs with many sharp points in a moving car. 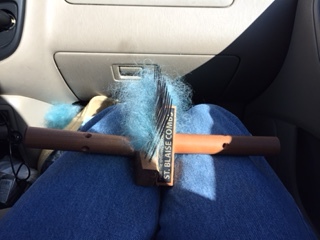 Steve expressed concern that if I liked combing in the car I might try to buy a picker at the festival and use it in the car on the way home. 🙂 But I didn’t. The cutest thing I saw was a mother Cotswold sheep with her two babies. Cotswolds are rare sheep and their fleece is long and curly. For some reason I loved the mother even more than the babies. I think it was her calm but observant demeanor and lovely curls. 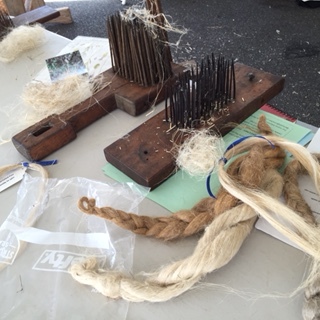 I learned a lot about processing flax plants to be spun into linen at a very informative display in the fiber tent. 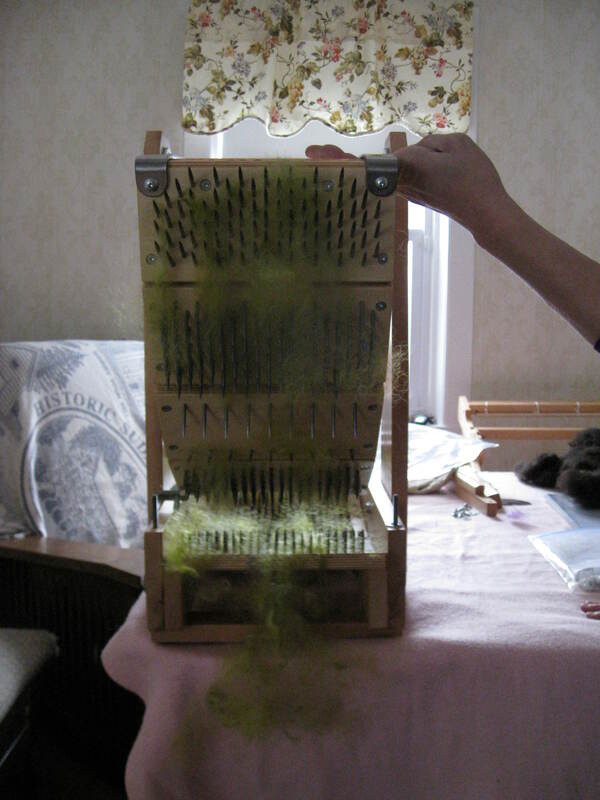 It is quite a process to get it ready to spin but it is durable. She had linens from the 1800s still in perfect condition. Funny how we still call sheets linens even though mine at least are cotton. Needless to say I found it exciting to see more sharp pointy tools. 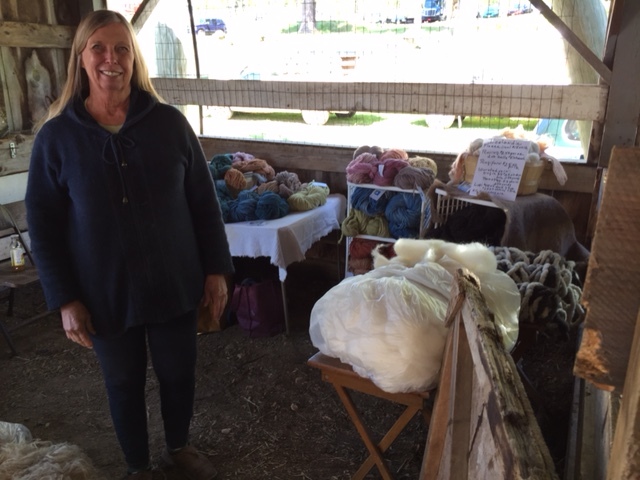 Our friend Dorothy had her booth full of beautifully naturally dyed yarn and fleece from her Icelandic sheep. 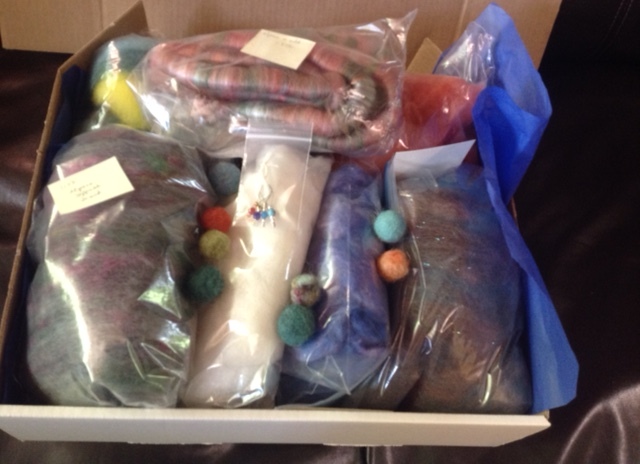 We had a covert fiber meet up at the trunk of the car and later this lovely box of alpaca fibers to spin resulted. Even though half of them are mine I still want to buy it. All in all pretty good day. 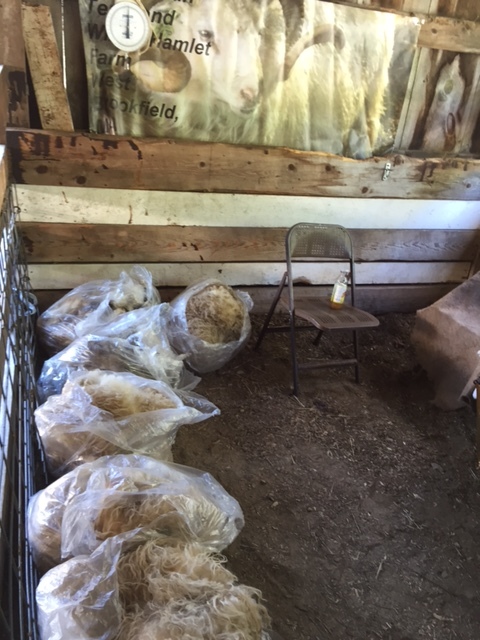 Spent time with friends, saw lots of sheep and learned new fiber information. What more could I ask? I returned home with car combed fiber without impaling my head or piercing my arm. They will look so pretty in batts. and I felt so efficient. Should I keep a set of combs in the car that I can use at traffic lights? 🙂 Or use to fight off car jackers? 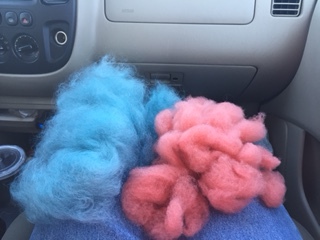 The blue fiber is from a Leicester longwool sheep and the coral colored is from a Gulf Coast sheep named Fernando. They are both rare and both live on Iris Creek Farm in Scotland CT.
Lots of good memories made on that day. This entry was posted in Uncategorized and tagged alpaca fiber, Cotswold sheep, Dorothy Benedict, flax, Gulf Coast sheep fiber, hand dyed fiber, hand dyed yarn, Hand fiber combs, hetchel, Icelandic sheep, Leicester longwool sheep wool, linen, Masssachusetts Sheep Festival, naturally dyed yarn, sheep festivals, Sheep wool, Wool picker for fiber on May 28, 2015 by Betsy Alspach.